Blue Topaz Strings is a smart choice for business gatherings and our ensembles are regularly chosen by events organisers from a number of top corporate establishments. We have numerous repeat clients, many of whom book their event music with us throughout the year. We are also popular for Corporate Christmas parties and annual networking events. 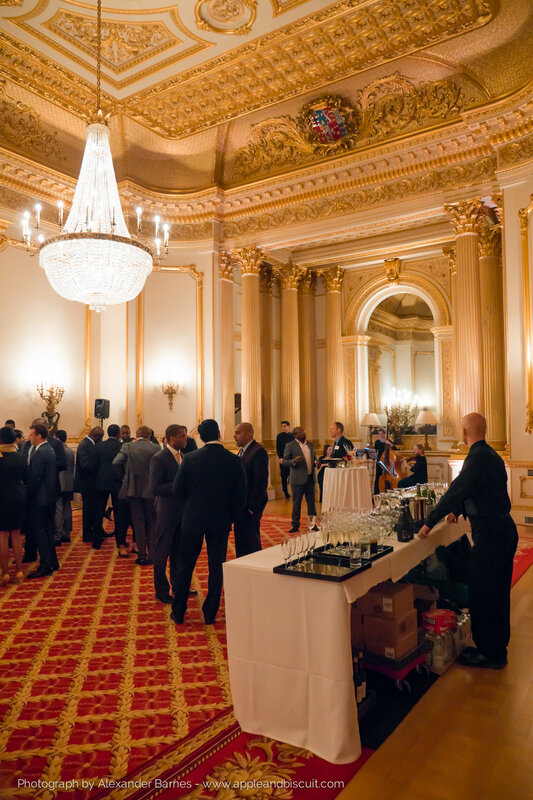 Whether you are hosting an awards ceremony, a drinks reception, a networking event, a corporate dinner, or an evening to entertain your top clients, we can add the perfect musical atmosphere and dynamic ensuring your event goes smoothly and professionally. We have over 12 years experience in providing excellent music for corporate events at a wide range of venues. A few of our our corporate clients include Microsoft, Wembley Stadium, Lloyds, Macfarlanes, Credit Suisse, T D Securities, Selectaglaze, ACCA Global, Bluestone Leasing, ifs Proshare, Westfield, Fremantlemedia, Milliman Insight and Vodaphone. Our musical styles include classical, jazz and contemporary pop. 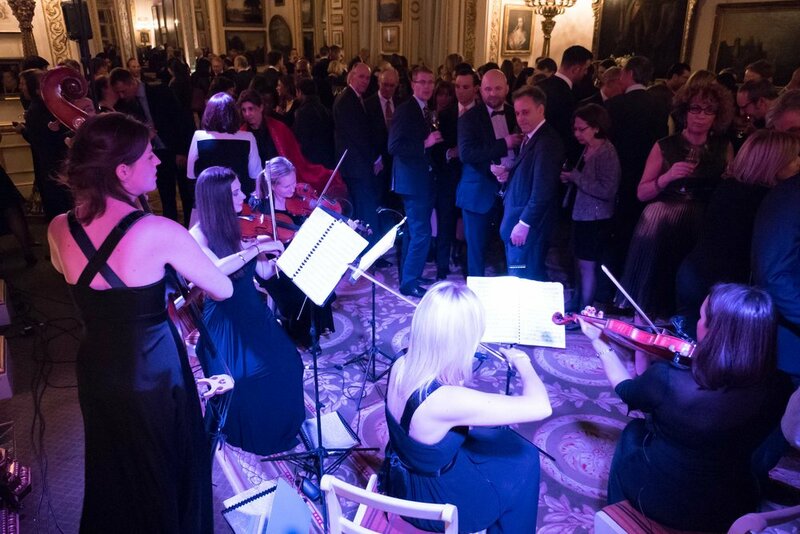 With our Royal Academy credentials and hundreds of corporate bookings under our belt, we understand which string line up and music will work for your event. If you are hiring one of the elegant historic or royal buildings such as Drapers Hall, Lancaster House or Banqueting House in London, perhaps you might choose our Exclusive Blue Topaz String Trio or Quintet playing traditional instruments and wearing elegant matching dresses. Alternatively either our Traditional or Blue Topaz String Quartet would also be well suited to these venues. If your venue is more modern, for example The Shard, Tate Modern or The Design Museum, our Electric Blue Topaz String Trio or Quintet could be a more contemporary choice to enhance the modern and sleek atmosphere. For larger events and receptions, amplification and sound engineers can be hired from us in order to boost our sound to the desired level. We can also bring along lighting to highlight the performance area and can include a vocal microphone for any speeches you may be having. All our equipment is PAT tested and fully insured. I just wanted to say a huge thank you for last night, they were delighted with you- and I think the client was rather taken by you all!! You are so easy to accommodate and so lovely to have around. To make a show stopping and high impact impression on your clients you could book the Blue Topaz String Orchestra. With a stunning array of beautiful string instruments performed by first class and beautifully presented musicians, this is the ultimate welcome for your corporate drinks. You could also consider booking our String Orchestra for a surprise moment or high impact performance during your event. For smaller spaces or more select client dinners you could book the virtuosic and highly proficient Violin/Cello Duo or one of our acclaimed solo instrumentalists. We offer a solo violinist or cellist who can play unaccompanied or with tracks on either traditional or electric instruments. We also offer solo harp and guitar. Looking for a band or large scale evening entertainment? With our excellent musical connections and knowledge we will have the perfect musical solution for your event. As well as filming our music, our videographers have extensive corporate experience and are also available to film your business event. Previous clients include Virgin Media and Allianz. Please enquire for more information and to book. “Just wanted to say a massive thank you to the girls for their lovely performance for us last week.